HOSE CLAMP PLIER KIT, ZR-36PUAD - ZIMBER TOOLS. К-т клещи за скоби за водни съединения 5бр. - ZIMBER-TOOLS. 1 pair x 280mm Flexible Ratchet Hose Clamp Pliers with twin remote cables 700mm long with flat ended hose clamping section. 1 pair x 200mm Cup and Slot Pattern Ratchet Hose Clamp Pliers. 1 pair x 200mm Cross pattern Ratchet Hose Clamp Pliers1 pair x 200mm V Pattern Ratchet Hose Clamp Pliers. Circlip plier (Bent open) - ZR-19PR - ZIMBER TOOLS. 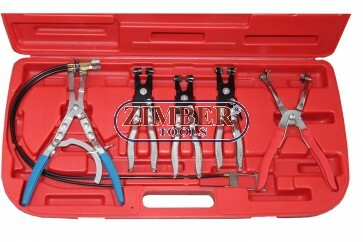 Angled flat band hose clamp pliers, ZR-36CPAFBH- ZIMBER TOOLS. 3PC HOSE PINCH-OFF PLIERS 8-10-12" , ZR-36HPOP03 - ZIMBER-TOOLS. Circlip Pliers Set 175 mm 4 pcs. - 447 - BGS technic. Circlip Pliers Set 225 mm 4 pcs, 650 - BGS technic Germany. Long Nose Pliers | straight | 200 mm. 337- BGS technic-Kraftmann. Bent Nose Pliers | 200 mm. 338 - BGS technic-Kraftmann. Diagonal Side Cutters | Stripper function | 165 mm.332 - BGS technic-Kraftmann. Combination Pliers 165 mm,325- BGS technic. Combination Pliers 175 mm. 326 - BGS technic-Kraftmann. Combination Pliers | 200 mm, 327 - BGS technic-Kraftmann. Wire Stripping Pliers | 150 mm-339 -BGS technic-Kraftmann. Flat Nose Pliers | 160 mm. 340 -BGS technic. Water Pump Pliers | Box-Joint Type | 400 mm 75113- BGS technic. FLEXIBLE HOSE CLAMP FOR CLIP-R TYPE, ZR-36HCF - ZIMBER-TOOLS. 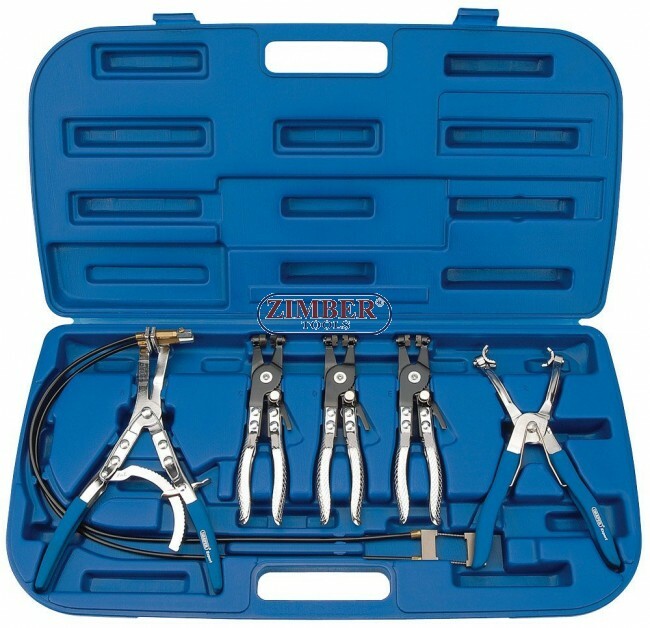 STRAIGHT TIP LOCK RING PLIERS,ZR-36LRPS-ZR-36LRPS - ZIMBER TOOLS.